I have an inexpensive Hamilton Beach hand blender (in Meduseld’s Amazon store) that I use for making Smokey Pumpkin Soup (recipe for that soon). 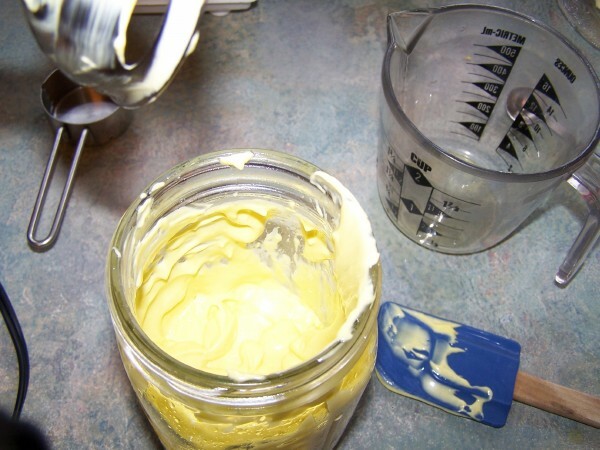 Using this nifty tool, you can make your mayonnaise in a wide mouth quart jar that can go straight in the refrigerator. The only thing to clean is the hand blender attachment. First, the list of ingredients for a very basic, thick and creamy mayonnaise. Then I’ll provide some variations. 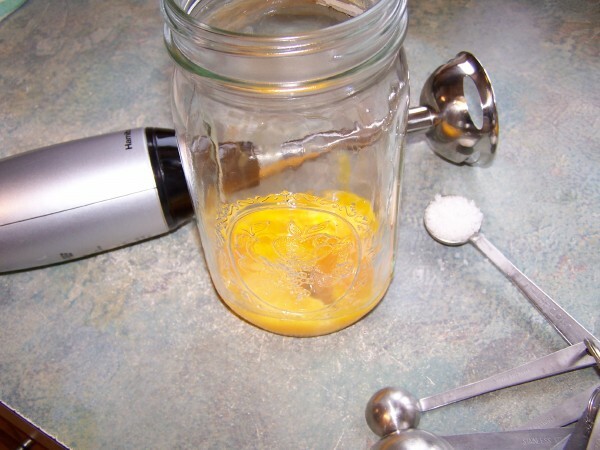 With the blender running, very slowly pour a trickle of one cup oil into the jar. Oil options are: olive, sunflower, grape seed, and blends of these and other oils. I do not recommend using soy since it can increase estrogen levels (http://americannutritionassociation.org/newsletter/whole-soy-story). This is very serious for men! As you pour in the oil, you will notice that the mix will start to get thicker. 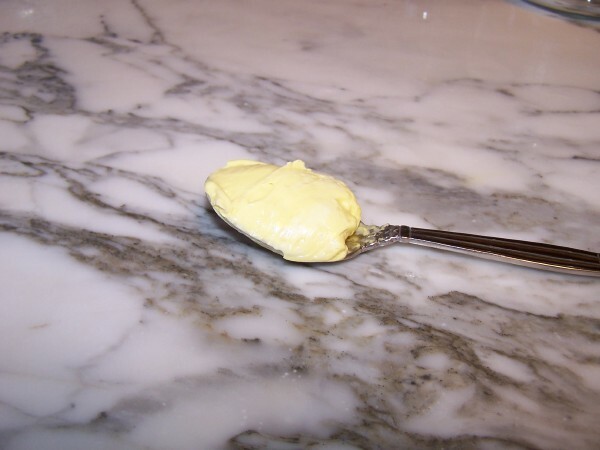 When you have added all the oil, you should have a thick mayonnaise. Now, add two tablespoons apple cider vinegar and blend. Voila! It’s that easy! That is a very basic version, not unlike the brand Dukes. It you want to add some flavor, you can mix one teaspoon mustard in with the eggs. You can add seasonings such as herbs and garlic. Or you can substitute half a freshly squeezed lemon for the vinegar. As part of a recent trip to Alexandria, Virginia, my son Gavin and I made a quick stop at Mount Vernon, home of President George Washington on the Potomac River. I have been to see it several times since arriving in the DC area in 1987, and it has changed substantially since the last time I was there by adding an enormous visitors center and underground museum. These new buildings and exhibits expanded on the view that I had held of George Washington, a view shaped by history books in public schools. Gavin and I waited in line with hundreds of other freezing people to see a glimpse of the house. We noticed a sign that explained the siding of the house. While it has the appearance of a stone facade, it is actually wooden siding that had fine sand sprayed on the paint while it was still wet, giving the illusion of masonry. Our own home has HardiPlank siding, a concrete siding that is imprinted to look like wood. And I laughed and thought it was ironic; George creating the illusion of making wood look like stone, and all the modern homes with vinyl and concrete siding to look like wood. It was nothing compared to the next observation. The tourist line wound through the opulent two storyed dining room with its ornate ceiling and carved marble mantle, back out onto the veranda overlooking the Potomac River, and back into the main hallway. The main hallway has another of George’s illusions. Not content with the inexpensive look of pine and oak that were available, the walls had been faux finished to look like mahogany. I scanned the room and heard the docent describing a key hanging in a prominent position in the hall – the actual key to the Bastille in France. The Bastille is a symbol of the French Revolution. In July 14, 1789, revolutionary protestors stormed the Bastille, freeing prisoners and killing the governor. People protested the alleged mistreatment of the peasant class by the aristocracy, and thus ensued a horrid period in history, where people were beheaded solely for who they were. The revolutionaries promised a better life and living conditions for the common man. And suddenly I saw George Washington in a completely new light. Here was a man who supported the French Revolution, to the point of holding the Bastille Key as one of his most prized possessions. As in this country’s revolution, he supported the rights of common man over the so-called abuses of the crown and aristocracy. He joined in those condemning the excesses of the aristocracy, their opulence and comforts. This advocate of the common man had 123 slaves at his death. Their treatment was terrible and their living conditions worse. A newspaper advertisement from his time showed that four of his slaves had escaped their abysmal conditions and he was advertising for their return. 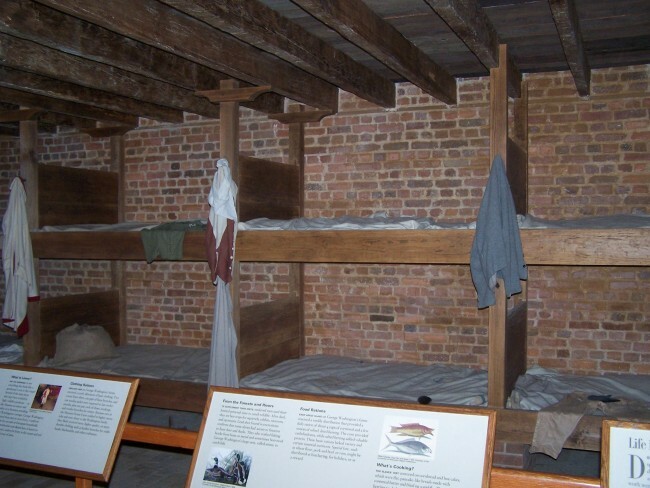 Here is a picture of the men’s slave quarters at Mount Vernon. The irony struck – hard. This revered man condemned aristocracy for their treatment of PAID workers who were FREE and could own their own PRIVATE property, while perpetuating a system where he OWNED people, never giving them a day’s wages, providing the barest necessities while he lived in opulence, and only freeing them in his Last Will and Testament. How convenient. From the moment of that revelation, the rest of the tour was not enjoyable. From my new perspective, the luxurious objects from France throughout the home and museum just reminded me of that hypocrisy, and the irony that this nation holds him up in high esteem while condemning a class that treated its subjects better. King George the Third is hated and reviled, although he had no slaves and all who worked for him were compensated, while history books in this country hold up as a hero a man who rejected that system and treated people even worse. 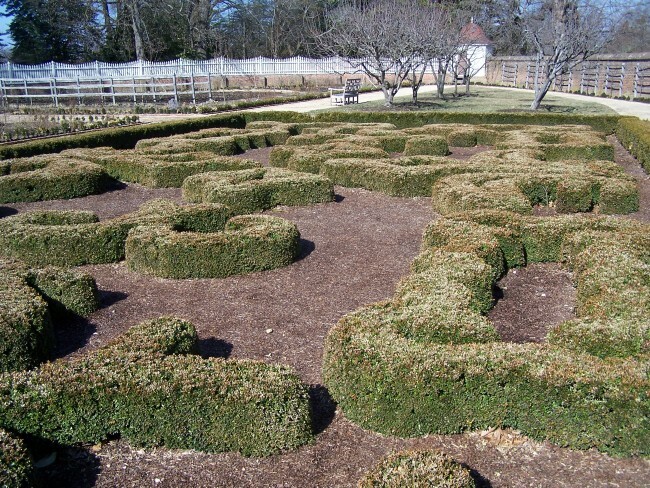 The museum was filled with priceless treasures, Mrs. Washington’s jewelry, furniture and objects de’ art dating to the French Revolution and before. Quite frankly, George lived like a King. And I could not look at these treasures without thinking that many of these stolen objects were looted from the homes of innocent people. People decapitated without trials, held in the temple prison without charges, phony witness and false accusations being the norm. And I thought of the slaves under “King” George Washington, required to live among these exquisite stolen items, wishing for their own freedom. Potatoes are one of the easiest and most versatile vegetables to grow. Even apartment dwellers can grow them if you have a balcony with several hours of sunlight. They can also be grown in greenhouses, high tunnels, or even an enclosed porch, allowing you to harvest delicious potatoes year-around. We used to only grow these in our garden, but have discovered how little space several plants can take if you use a stackable system. Several options include using old tires, trash bins with drilled holes for drainage, or wooden stackable boxes. We prefer not to use tires due to the chemicals and petroleum product residues that can leach into food – and the same goes with plastic tubs and containers. I saw a picture recently of someone planting lettuce directly in a plastic Miracle Grow soil bag, and it seems to defeat the point of growing something yourself. You can buy stackable boxes and raised beds from garden centers, but these can be exorbitantly priced. We have solved this with inexpensive and durable rough sawn oak boards. You can make these boxes with any untreated wood from the hardware store. Please don’t make the boxes out of pressure treated boards, that will also leach chemicals into your soil. Take the boards and cut them into equal lengths – approximately 2 feet long makes a good-sized box. If you have a dirt floor to grow this on, you won’t need a bottom, otherwise, cut a piece of plywood to fit your dimensions. Make extra bottomless boxes in the same dimensions. These will be your sides as your plants grow. We mix a soil mixture of approximately one-third top soil, one-third compost, and one-third seed starter mix with lots of peat. Potatoes don’t like to grow in hard soil, so the peat mix makes the soil considerably more lofty. Take seed potatoes, or even store potatoes that are beginning to sprout. Don’t use potatoes from the store that are not sprouting since they may have been sprayed with a substance that will prevent them from sprouting. These will never grow. You can order seed potatoes. Buying organic ones is also a good option. Buy late season potatoes since they will continue to send out new potato shoots throughout the growing season! 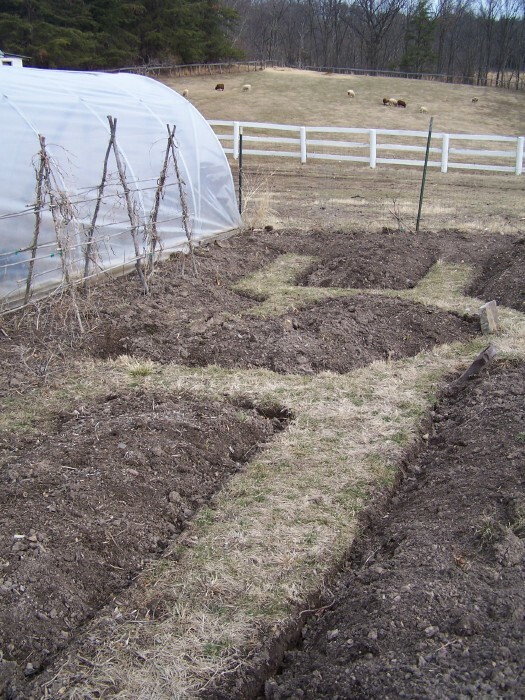 Plant the potatoes in the lowest layer and cover with soil. Before long, you should see potato plants pushing through the dirt. Keep them evenly watered but not soggy. As they grow. 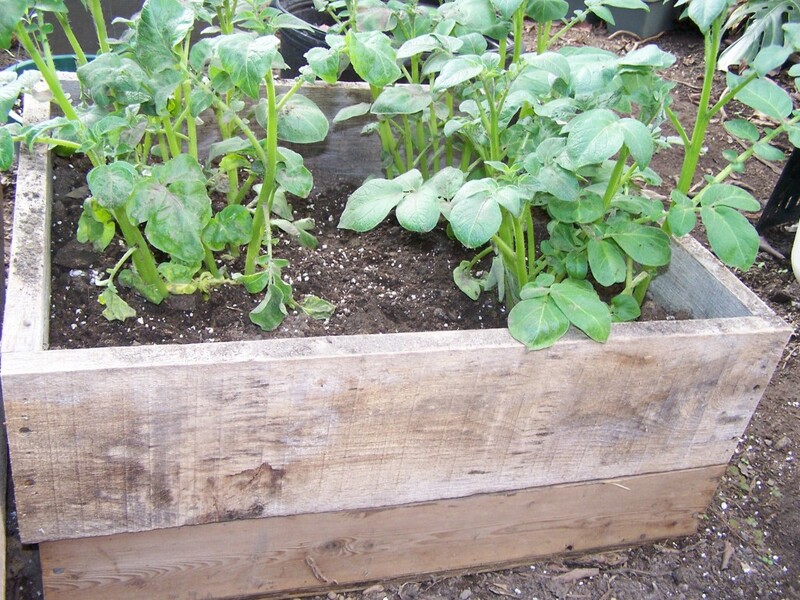 Add anther wooden “box” and start building the soil around the base of the plants always leaving a portion of the plants exposed for photosynthesis. These potato plants have pushed up through their second layer and are now ready for a third box. As they grow, they will put out extra roots that will form potatoes, filling the box as it grows taller. You can start harvesting the potatoes when the plants have bloomed. This is the baby potato stage. If you want larger potatoes, wait another month or two.